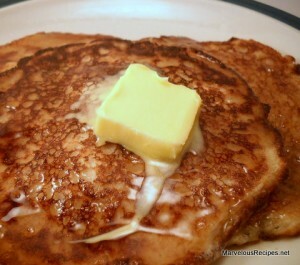 My little ones really enjoy these hearty pancakes hot off the griddle for breakfast. They usually ask for seconds! Combine the first seven ingredients in a large bowl. In a small bowl, combine the egg, buttermilk*, oil and vanilla. Stir the egg mixture into the dry ingredients just until moistened. Spray griddle with cooking spray. When hot, drop batter by 1/4 cupfuls onto griddle. Turn the pancakes when bubbles form on the top. Cook until the second side is golden brown. Serve with maple syrup and butter, if desired. Makes 4 servings. *If you don’t have buttermilk on hand, just put 1-1/2 tablespoons of vinegar in a measuring cup and add milk to equal 2 cups, as a substitute. oooh, these sound so yummy! We love pancakes! I bet these would be good with pecans in them too!